Industrial customers use content to research and make purchasing decisions. Are you giving them the info they need to choose your products or services? 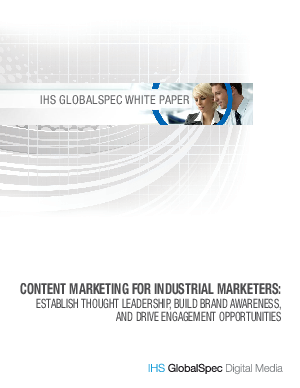 Developed by IHS GlobalSpec, this white paper explains the growing importance of using content in your marketing mix to attract, acquire and engage engineers and technical professionals. Content Marketing for Industrial Marketers will teach you how content marketing can complement your current marketing strategy. Use it for helpful recommendations to construct an effective plan and deliver the resources that can ultimately make it easier to sell your products and services and drive revenue.